The former First Lady's mom is not easily impressed! Moms! They love you more than anything, but they're never going to take you too seriously ... even if you're Michelle Obama. 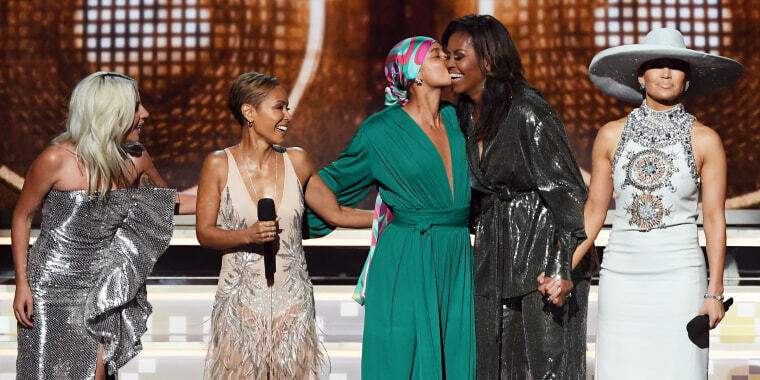 On Sunday, the former First Lady attended the Grammy Awards as a special invitee and received a 25-second standing ovation from the entire arena. But to her mom Marian Robinson, 81, Obama still hasn't achieved "real-star" status. Click the arrow to see the second page of texts. "Did you meet any of the real stars or did you run right after you were done," her mom asked. "When your mom doesn't think you're a 'real' celebrity... Tonight in Phoenix, I shared this text thread from my mom from #Grammys night, and I just had to share it with all of you. #TextsFromMom," wrote Obama in the caption, referring to a stop on her "Becoming" book tour in Arizona. On Sunday, Obama walked out on stage early in Sunday's award show, standing side-by-side with show host Alicia Keys, plus Lady Gaga, Jada Pinkett Smith and Jennifer Lopez. All of them received big cheers, but Obama's was clearly the loudest and longest. So yeah, we bet she also met the "real" stars, too!